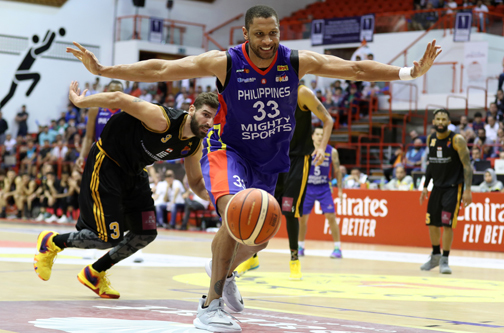 Dubai, United Arab Emirates—Team Mighty Sports-Philippines proved that it is a force to reckon with in the 30th Dubai International Basketball Championships at the Shabab Al Ahli gymnasium here by surpassing its toughest test yet on Sunday night, holding off formidable Homenetmen of Lebanon, 96-89, for its third straight victory. Sweet-shooting big man Randolph Morris and in-form Justin Brownlee delivered their usual numbers, while Fil-Am wingman Jeremiah Gray provided immense boost off the bench as Mighty Sports practically secured the top seeding in Group A and proved it is for real in the 10-team tournament. The 6’10” Morris, armed with a feathery touch from the perimeter, accounted for a team-high-tying 24 points, 15 of them coming in the opening half, while Brownlee sustained his fiery form with his second straight double-double of 19 points and 13 rebounds on top of seven assists and two steals. Not to be outshone was Gray, who emerged as the biggest revelation offensively by knocking down 24 points, spiked by three triples, while adding eight rebounds and three assists in what could be considered as his coming out party much to the delight of the raucous Filipino crowd. But more than the numbers, Mighty Sports coach Charles Tiu admitted he’s more pleased to see how his wards showed steely nerves down the stretch in the face of the Homenetmen’s gritty rally, led by irrepressible guard Walter Hodge, who finished with 42 points. The accessories and apparel team backed by SMDC, HealthCube Medical Clinics, Go for Gold and Oriental Game also avenged its 100-93 loss to Homenetmen two years ago and put itself in a strong position for a top finish in Group A.
Backcourt standouts Jason Brickman (10 points and five assists), Juan Gomez de Liano (11 points), and Roosevelt Adason (eight points and five rebounds) also did their fair share for Mighty Sports, which will take a one-day breather before plunging back to action against Al Wahda-Syria for its final preliminary round match on Tuesday at 9 p.m. (1 a.m. Wednesday, Manila time). So far, the Filipino cagers continued to do so behind their fluid offense and relatively solid defense, with Gray tallying 14 points in the first two periods to complement the consistent performances of Morris and Brownlee. Mighty Sports led by as many as 16 points in the third period and appeared on the way for an easy windup, but the Lebanese side refused to roll over and die, pulling the closest at three—89-92—off Chris Johnson’s two made freebies with 58.8 seconds left. MIGHTY 96—Morris 24, Gray 24, Brownlee 19, Gomez de Liaño 11, Brickman 10, Adams 8, Odom 0, Manuel 0, Gutang 0, Santillan 0, Banal 0, Rike 0. Quarters: 25-18, 51-44, 77-63, 96-89.